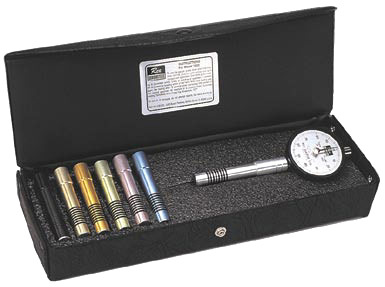 The Multi-Scale base kit consists of a Rex A scale durometer (with standard, silver barrel for soft rubber, plastics and elastomers, printer's rolls), and your choice of one or more color-coded barrel adapters for B, C, D, DO, O, OO and OOO scales (see the included chart for applications). Changing scales is accomplished by unscrewing one barrel and replacing it with another - no supplementary calibration or adjustments are necessary. A test block, calibrated to the selected scale, is also included. The block allows the user to perform quick functional checks on the instrument. The indicator and barrels are made in the U.S.A., and are calibrated to the ASTM D2240 standard for durometer hardness testers. Type B Pink Harder elastomers and plastics. Paper and fibrous materials. Use above 93 Duro A. Type C Yellow Medium hard elastomers and plastics. Also useful to avoid surface marks. Type D Gold Hard rubber and plastics such as thermo plastics, flooring and bowling balls. Type DO Green Dense granular material, textile windings. Type O Blue Very soft elastomers, textile windings, soft granular materials. Use below 20 Duro A. Type OO Black Light foams, sponge rubber gels, animal tissue.